Small Space Inspiration From the Sunset Magazine Silicon Valley Idea House - Hej Doll | Simple modern living by Jessica Doll. This post is sponsored by Samsung. A while back, I got to take a tour of the Sunset Magazine Silicon Valley Idea Home and was completely blown away. Designer Lauren Nelson did such a good job, and I fell in love with every room I set foot in. I wished so badly that I could use it as an inspiration to redo our entire home, but luckily, I was able to get some great takeaways on how to do small, tasteful room refreshers with appliances and more. 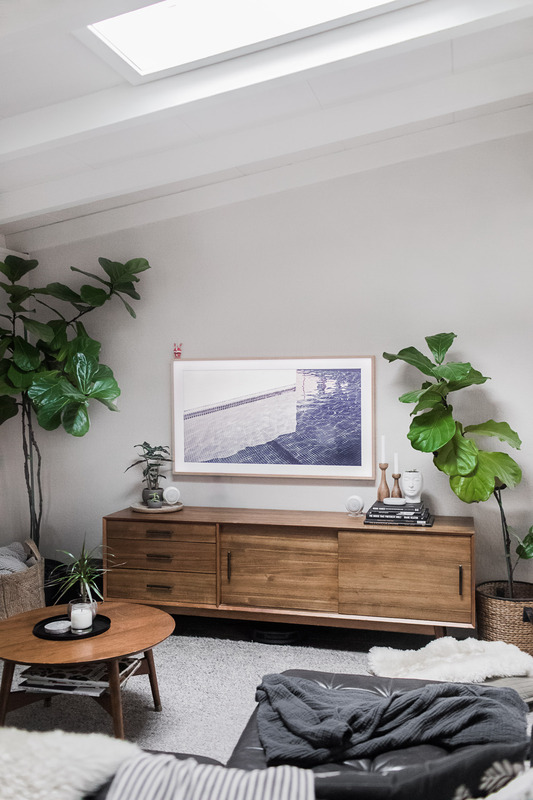 I partnered with Samsung to show some great tips for small spaces and to share things I loved about the Silicon Valley Idea House. Not only does the entryway feature a traditional front door, but the entire front facing wall slides open to reveal a welcoming indoor/outdoor space. I love the natural light that it allows in. The home didn’t feature a huge entryway, but my best small space takeaway I learned from that is to use “half” furniture. The entry table was custom designed and took up a very small amount of space compared to a normal entry table or console. A bowl was placed to collect keys and other items so that the surface remained clear and uncluttered. Like in our own small home, the kitchen and dining room in the Sunset Idea House are a blend of spaces. Long gone are the days where entertaining is such a formal affair that people can’t gather around the kitchen to talk and share memories while food is being prepared. There was a dining bench along the wall for extra seating and the table can be pulled away for a more formal affair. The matte black (my favorite appliance color to date) Samsung Chef Collection appliances in the kitchen really made a lasting impact, especially by being paired with the black marble dining table and lighting elements to create cohesion in the space. The kitchen featured the 36” Chef Collection Gas Cooktop and 36” Wall Mounted Chef Collection Bluetooth-enabled hood, both of which can be synced together so the hood can turn on if something is burning below. In addition to being stylish, these appliances really are practical for those days when being an at-home chef doesn’t go as planned. The kitchen also featured the 30” Chef Collection Microwave Combination Oven with steam cook capabilities and a Flex Duo divider that allows you to cook two dishes at once at different temperatures. The Chef Collection fridge has panel ready design to adapt to your existing cabinetry, for a perfect kitchen refresh idea, and also features a FlexZone area which can be switched between freezer and refrigerator as needed. The sofa in the main living room was custom made to fit the space, and you can do the same for your smaller space. Don’t be afraid to reach out to furniture makers, if you love something, but just can’t make it fit. A large scale mirror helps reflect light in a dimmer area of the home, making the room appear larger. In the bedroom, a wall-ledge ran behind the master bed, adding a space for décor and eliminating the need for traditional nightstands if you need to in a smaller space. On the right, a gallery wall placed to the side helps add an art element without overwhelming the room. In the hallway to the laundry room, more art is on display, proving that there is no right or wrong place to add décor. It inspired me to hang some of my favorite art in my narrow hallway to add more interest. Inside the laundry room, there is additional storage, ensuring functionality. The Samsung FlexWash + FlexDry units also add sleek elegance to the space and feature separate units on top of for smaller, delicate loads, making it easier on the environment and a good time saver for you. They both feature WiFi connectivity, so you know exactly when your laundry is done right from your phone. While the master bath in this home was very spacious, I loved the nooks for storage on on-counter display of items used every day. When you select items that are beautiful, you don’t mind having them on display in your home. The moral of this post is simply to not be afraid to think outside of the box when it comes to styling and deciding how your small space should function. It should serve its inhabitants first and if something doesn’t make sense, don’t feel like you have to do it just because it’s traditionally done a certain way. This post is sponsored by Samsung, a company I’ve been a fan of for years and partnered with before. Thank you for helping to support the sponsors that make life here at Hej Doll a little sweeter. Beautiful house!!! I want to move in. I love Sunset and am a subscriber, so I think it’s so neat you got to tour the home! Thanks for these totally applicable ideas to make the designs work in a smaller space. This is so beautiful! What great ideas. Wow, these rooms are gorgeous! I could have used some of these tips in our last home! Your home looks beautiful and your tips are spot on. When designing any space, big or small, everything has to have the right proportion. It’s common sense, yet I see it over and over again how people struggle with that. But you’re absolutely right, reach out to furniture makers and make it fit your needs. Ultimately, our homes must serve their purpose. Wow! I’m feeling inspired now! This is totally on trend! This space is absolutely gorgeous! Awesome!! Everything looking so beautiful and in good order..I love your post. It looks very minimalistic and creative at the same time. Thank you for sharing this idea!